Growing up we watched movies like Terminator, iRobot, Matrix, predicting a future dominated by AI and robots living in co-existence, sometimes annihilating the human society. It’s 2018 and that future isn’t so far away anymore, what started as simple chatbots and mobile assistants like Siri or Google Voice which are powered with AI tech, have grown into fully fledged AI communities like IBM’s Watson, working to make this future a reality in our daily lives. If you’re up to date on all things AI like we are, you’ll know about the most popular humanoid, Sophia, – the world’s first humanoid robot, who is also a citizen of Saudi Arabia and can display 60 types of facial expressions and carry a conversation. Yet, few people know that Ethiopia, one of Africa’s fastest-growing economies is home to a team of developers that worked in collaboration with its creator, Hong Kong-based, Hanson Robotics to make her. 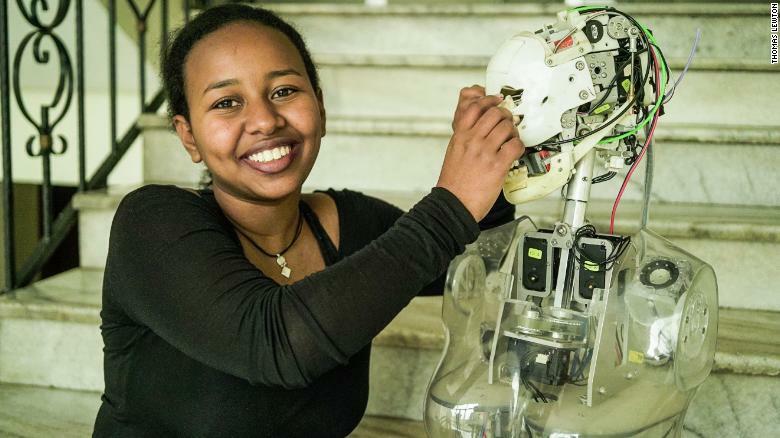 iCog, the Addis Ababa based artificial intelligence (AI) space founded in 2013 was part of a team of scientists that developed the software for Sophia – the world’s first humanoid robot. iCog has customers in USA, Canada, Hong Kong, and China and at home, works with the government on software and hardware development. “iCOG Lab is one of most strongest AI outsourcing company in Africa. We have a part in developing of world-leading robots in emotional and expressions. We are building a world-leading AI blockchain platform we call it singularitynet.io. We are a core participant of this one. So, I can say we are in the leading edge of AI and blockchain. But nobody thinks that this image is true. Nobody thinks that this is a reality,” said Assefa. Tech spaces like iCog are creating a cyberspace in ‘Sheba Valley’ that allows coding geniuses like 19-years-old, Betelhem Dessie to flourish. Dessie at her young age is already one of the leading minds in Ethiopia’s tech scene, coordinating a number of nationwide programs run by robotics lab iCog, she also has four software programs copyrighted solely to her name – including an app developed for the Ethiopian government to map rivers used for irrigation and it all began when she was just 9. Dessie dreams of a future that involves more young people in the tech scene, she travels the around the country working with students to inspire the next generation of innovators and entrepreneurs. She does this with various programs like “Solve IT” which she leads on at iCog is, aimed at working with young people to find technological solutions to community-based problems. Dessie hopes to inspire the next generation of coders in Ethiopia and Africa more broadly – particularly girls. “The bus will go around Ethiopia equipped with laptops and other electronic materials such as 3D printers to create more awareness on these technologies – using Sophia as a brand to attract,” she explains an upcoming project called ‘The Sophia School Bus’.